A pair of armed guards approach from the gate of Xantharl’s Keep, bringing summons from Helder. The hunt is nigh. Besides myself, Audric, Oreiron, Bonie and a pair of Anaithnid men, Omgrath and Nazag, answer the summons and we make ready to depart. Bonie still seems pale and sickly; I take it for nerves, as none of the symptoms match the Black Rot. Audric offers to let her stay, but she shakes her head determinedly, indicating that she’s ready to continue. We are escorted into the keep, passing the outer palisade. Not much of a welcome awaits us; we are brought to Helder and a small group of townsfolk, among them are Yishma, her husband, and a young man of about 20 years. Yishma hands us a parcel of salves to ward against acceleration of the Black Rot, should any of us come to harm, and the young man is revealed to be their son, Wyardt. Two other groups of hunters are waiting, with Helder planning to lead one of them. We are to divide and conquer, each of us taking a trail miles apart that will take us three to four days from town. Wyardt tells us that he has grown up in the woods and feels confident that he can lead us safely. We are led to the southernmost of the three trails, which Wyardt says he knows quite well. The air is cold but there’s no snow or frost; the weather is clear and makes for easy travel. Wyardt takes the lead, sharing a few words about his parents. He explains that they have good hearts, and that they see beyond stigmas—a trait that Wyardt tends to live by, as well. We travel in two smaller groups, with Wyardt, me and the two Anaithnid in the front, and Audric, Bonie and Oreiron in the rear, hoping to mitigate the noise of our more heavily armored companions. The trail winds deeper into the Lurkwood, occasionally ascending a hillock or dipping into a ravine, but so far, our visibility is good, and the travel is easy and uneventful. After a few hours, we come across a large bootprint in a patch of broken ground, leading north from the trail. We also find a tuft of fur stuck in the bark of a nearby three—signs that there is a bugbear presence, but we already knew that was the case. What is surprising, however, is that the signs are discovered so close to Xantharl’s Keep. With little to follow in the way of a clear path, we decide to continue along the trail, warier for our knowledge that the bugbear threat is close. As the afternoon fades, Wyardt says we should push on a few hours more, and we take his guidance. We descend into a grove and notice a disturbance with a few trees ahead. Knowing that the bugbear are crafty enemies, we fear an ambush and decide to split the group. Wyardt and I will take the Anaithnid and flank the group, approaching from multiple angles. Audric, Bonie and Oreiron make a fair amount of noise, hopefully obscuring any sounds we are making in the wood, though it’s a safe bet that if there are indeed enemies, they already know we’re here. A pair of large oaks lie ahead and pinned to each tree is what appears to be a skinned humanoid, stuck to the tree with spears and other sharp implements. The sight is revolting, and the splay of limbs and the queer angles of the corpses' joints make it clear that the deed was torturous. I split from Wyardt to investigate further, and it seems that they were human men. The Anaithnid seem agitated, and after trying to communicate with them, we determine that the bodies probably aren’t Anaithnid but that they are perhaps Uthgardt—after further discussion through gestures, we discern that they weren’t a tribe friendly to the Anaithnid. We light a torch to better investigate the scene, knowing that there’s little harm to come from the light. We’ll have to light a fire for camp anyway. Unfortunately, we find no other signs that provide any clues as to the identity of the men or motivation for their torture. Backtracking a bit, we find a hill and make camp, setting a fire and discuss watches. The night passes quietly and uneventfully, and our scout around the camp in the morning turns up no signs of any nocturnal visitors. We pack up and continue, returning to the valley with the corpses. We find them much as they were left the previous day, and the daylight investigation reveals no additional clues. Wyardt does, however, find signs and prints from bugbears, but nothing that leads in any obvious direction, just more incidental traces. We decide to continue along the trail, traveling throughout the morning. Around mid-afternoon, we come to a significant descent that leads into a low valley that is flanked by rock walls. We decide to push through as bypassing the valley isn’t pragmatic, so I go ahead of Wyardt so that if anything does happen, there’s a buffer between the groups. At the base of the valley, I hear a rustle in a bush nearby. Sensing an ambush, I decide to turn tail and run back towards Wyardt and the others. Fortunately, my instincts were good—a pair of unidentified missiles whir by my head striking trees. I retreat to the others, and we prepare to fight! From seemingly out of nowhere, a half dozen kobolds appear in the valley, a result of one of Audric’s conjurations. An axe is thrown from a nearby tree, striking Audric in the shoulder, heralding the advance of five bugbears, positioned in a star formation around our group. I appeal to Malar for a blessing, while the others draw various ranged weapons. Seizing the initiative, I throw my morning star towards one of the enemies and a ghostly manifestation of it appears several yards away, behind one of the creatures and striking it. Bonie climbs a nearby tree and readies her bow, then a hail of weapons is thrown towards us. 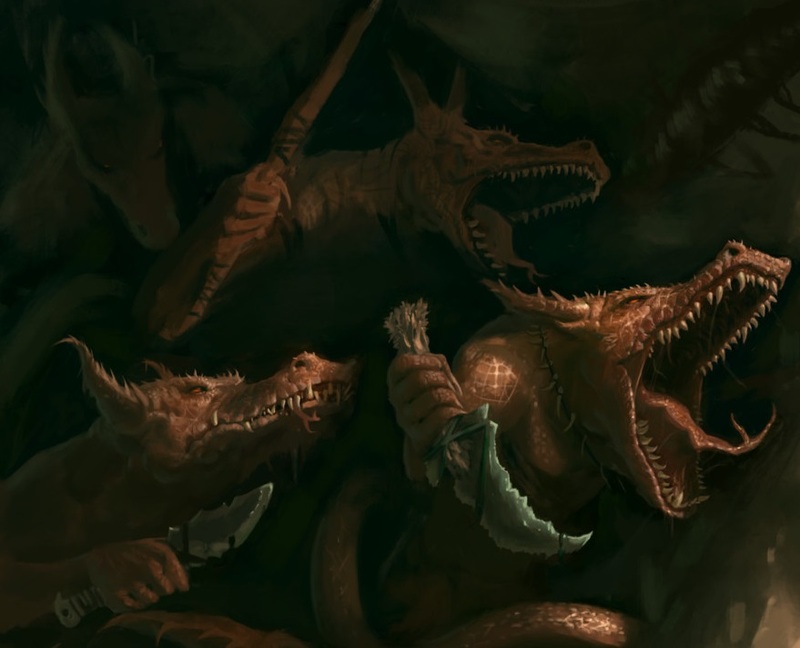 One strikes me and one strikes one of the Anaithnid, and then Audric’s kobolds pile onto one of the bugbears, wounding it in several places. Meanwhile, Audric summons forth a swarm of bats to assault another of the foes. My spiritual weapon slams into the bugbear again, and it rushes me from the cover of the forest, fortunately missing its lunge. One of the kobolds is devastated by a bugbear, and the bugbear struggling against the swarm of bats surges into melee with the group. Bonie and the archers miss with their first round of arrows, as does Oreiron with his sling. One of the bugbears charges Oreiron with a spear, and the dwarf falls to the grievous wound. The wounded Anaithnid is wounded yet again and struggles to stand against the injuries. The small army of kobolds manage to bring one of the bugbears to the ground, impaling it with their tiny spears. A brutal melee ensues. Audric unslings his axe but is unable to land a blow, though I manage to strike my foe in the head. It is a brutal strike, but the creature stares back at me defiantly. Bonie shoots the unwounded bugbear, and Wyardt draws forth a longsword and in a sweeping strike, beheads the creature that had been assaulted by Audric’s bats. The bugbear retaliates against me but it’s a glancing blow, and one of the tribesmen lands a strike against a foe as well. The melee is fierce, though the tide seems in our favor; the wounded Anaithnid slays a bugbear, and Audric cleaves another nearly in half with his mighty axe. The ring’s magic, fortunately, is silent. The final bugbear engaged with me seeks to withdraw, and I charge it with a roar, striking it down with my morning star. I growl a thanks to Malar as I ravage the creature, taking teeth from it as a trophy and five right ears as proof for Helder. In the aftermath of the melee, Audric stabilizes Oreiron and we tend everyone’s wounds; all but Oreiron are fully healed, the dwarf being beyond our means to magically heal today. We apply salves to the dwarf to prevent the onset, or at least delay the effects of the Black Rot. We make a quick search of our foes, finding nothing of value beyond the crude weapons they carried. We decide to press on a short way to put some distance between us and the valley, then to make a camp so that Oreiron can have a chance to recover. We awaken in the morning, the only excitement of the night being a family of wild pigs heard in the woods during the middle watch. Audric ministers to Oreiron, healing him with the blessings granted by Mystra, and it seems for now at least that the dwarf has not yet succumbed to the disease. We press on throughout the day and encounter no signs of enemies, deciding to camp one final night, as pressing on through the darkness seems unnecessary and dangerous. The next morning, the sky is clear and the day bright, and we arrive back at Xantharl’s Keep around midday. No one in our group has manifested any signs of the Black Rot. We learn that one of the other groups has already arrived, having encountered nothing along their three-day trek. 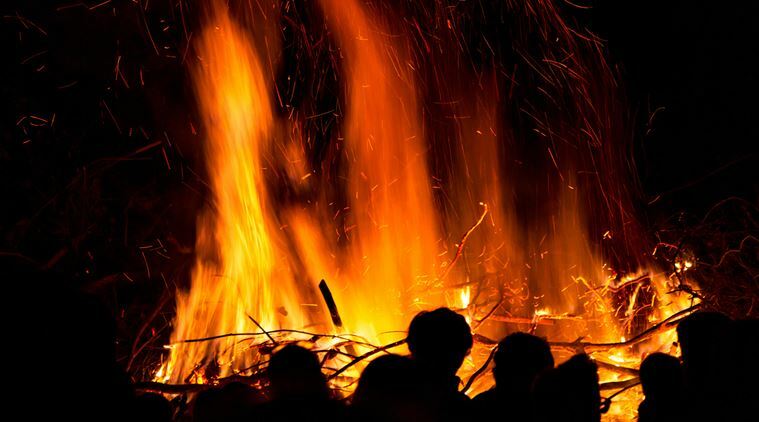 We also see a bonfire surrounded by the women and children of the Anaithnid—but upon closer inspection we realize that it is instead a funeral pyre. Selben runs towards us, tears in his eyes, and he explains that the Anaithnid were attacked in the middle of the night by bugbears; the tribe rushed towards the gates of Xantharl’s Keep seeking safety. The gates were opened, and guards emerged to help defend the tribe, but not soon enough to prevent a melee. Kezia sacrificed herself so that the others could escape, throwing herself at the enemies. Selben explains, through tears and shakiness, that she was struck down by the creatures, her blood everywhere. Selben seems in shock, as if blaming himself for not having done more. I tell Selben to rein in his emotions—the Anaithnid are sad and grieving, but not with open expression or crying. There is nothing more he could have done. I let Selben know that he needs to control his emotions and communicate as best he can with the tribe, promising to discuss it and grieve with him in private later. I spend a long time before Kezia’s fire with the rest of the tribe, only turning away when necessity and responsibility dictates. 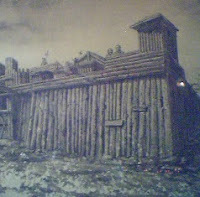 Through Selben and Nurué, I tell the tribe to make camp for the night within the walls of the keep. After the defeat of Crahdorn, the subsequent hours are spent discussing plans for the pending journey, gathering what meager belongings the tribe possess, and carrying out the sacrifice of the diseased warrior. Trading lives is not a fair thing, but we can’t afford to slow our travel without effectively signing the death warrants of both the man and Nurué. Kezia translates, and the tribe decides to conduct its own sacrifice, sending him along the spiritual paths with prayers to Uthgar. We make it clear that we will do our best to see the group to Griffon’s Nest, but that it will not necessarily be a quick or direct path, and that it will not interfere with our current plan to travel to Longsaddle. Fortunately, there seems to be agreement that Longsaddle is our best chance at determining the cause and hopefully a cure for whatever this curse or sickness is that afflicts Nurué. Selben is instructed to continue to pursue his relationship with the younger members of the tribe, in the hopes that his can pick up some of their language so that we don’t have to rely completely on Kezia’s translation. Ahead on the trail, we see the shambling form of a large, crimson-furred creature, larger than a man. It looks gaunt, weakened, and hunched over—a bugbear. After a few moments of deliberation, considering that it may be an ambush, we decide the chance that it’s diseased is even more dire, and arrows are loosed upon it. Several find purchase, but not enough to fell it, so I charge forward and finish it with my morning star. We examine it for signs of disease and can’t find any, but we’re not sure if it’s for lack of symptoms or just that they’re obscured by its fur. Unfortunately, we’re not able to make the safety of Xantharl’s Keep before sundown, and we decide to camp for the night. Even if we finish the trip, we’re not convinced that we would be allowed entry, especially with the diseased woman. Nurué seems to have worsened, her fingertips are blackened, and she seems very much diminished. After some discussion, we decide that Audric or I will conjure forth mounts and send Audric, Oreiron & Nurué ahead. Mystra or Malar, or perhaps even Uthgar are with us, and nothing ill befalls us in the night. Well before the sun rises, Audric rouses Oreiron & Nurué with the intent to leave in the predawn. If a cure is to be found within Xantharl’s Keep, this is our best chance to acquire it. They arrive at the wooden, picketed walls of the keep at first light. 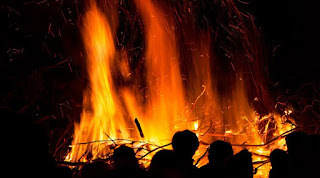 The remaining group travels along the road and eventually reaches Xantharl’s Keep, where we are flagged down by Audric and Oreiron, who have made a small campfire outside of town. They were not allowed entrance and instructed that the town’s priest is away at Grunwald, a day away. Some of the men of Xantharl’s Keep had encountered bugbears and returned yesterday, and several have been stricken with the same disease. There is also apparently no love lost between the Anaithnid of the Lurkwood and the men of Xantharl’s Keep, but it is of no consequence as we’re all barred entry anyway. As we contemplate options, the gates open and a middle-aged couple exit the keep approaching us carrying a small pot and a basket, and Audric greets them. They claim to have heard that there is a sick woman among us, and it appears that they have brought food. “My wife is an herbalist, and there is a salve that can help relieve the symptoms of the rash.” The wife’s name is Yishma, and she started putting the salve together, having seen a similar disease twenty years ago. Yishma takes a small tin from her basket, a mixture of lavender and chamomile as well as other herbs from the wood. She explains that the disease is bloodborne and travels very quickly among open wounds. Audric inquires what it may have taken in the past to cure the disease, and they claim that only strong clerical magic could produce a remedy—magic such that Klaighos, the village priest, possesses. They ask for nothing in return, and we explain that we intend to travel immediately with the hope that we encounter the priest on the road. They explain that the village leader wouldn’t look upon this kindly, forcing upon us a decision—stay and await the return of Klaighos in the hopes that he will tend to Nurué before she perishes, or risk the doors of Xantharl’s Keep being barred if we come between their diseased men and their priest. We decide to stay and await the return of the priest, and Kezia explains the situation to the tribe. The husband explains that the disease is progressive, and that if it spreads from Nurué’s fingers to her arm, then there’s a chance it will corrupt her entire body—amputation would be our best option to delay progression of the disease, in that case. We thank them again for their ministrations and their kindness, and they depart. Later that day, another figure leaves the gates flanked by a pair of soldiers, this man armed with a pair of swords and leathers. He carries a barrel under his arms, and Oreiron explains that this is Helder Mornstone, leader of Xantharl’s Keep. We gather Bonie and Oreiron, and Helder greets us, inquiring after our afflicted and her condition. Upon seeing Nurué, he explains that she may be the worse off, but that he must prioritize his own men before outsiders. He asks how we came to travel with “barbarians,” which sets my blood boiling. Hackles rising, I ask if our tribe is unwelcome outside his walls. “If you were, you would not be here, I assure you,” he replies grimly. He deposits the barrel, explaining that it is full of dried meats and cheeses, enough so sustain our group for a few days. I thank the man, dryly. “I’ll be sure to spread word of the hospitality of Xantharl’s Keep.” Helder does not reply to the statement but produces an offer that may ameliorate the situation. 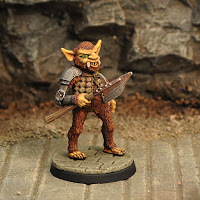 Accompany his men into the Lurkwood to deal with the bugbear threat, and he will take Nurué’s diminishing condition into consideration when Klaighos returns. Kezia storms off, speaking to the men of the tribe rapidly. We’re not able to comprehend the words, ere she spits a reluctant compromise. “Do as you will.” It is a cold response, and hints at more conversation to follow later. “Yes,” is her reply in a surprisingly sultry tone, leaning into me. Her reply, and the response her physical proximity elicits, leaves me speechless. I decide to leave the decision to Audric, since he is admittedly the most sensible of the group. His answer is surprising, that he intends to accompany me on the hunt. “So you wanted the opportunity to be mad at me about it, but you want me to do it anyway?” It’s not clear that Audric wants to join the hunt, or that we should be involved with it at all, but he reluctantly agrees. Both Bonie and Oreiron are on board with the hunt, each for their own reasons. Loyalty, duty, guilt—whatever the motivations, they are not important, and we are glad to have their aid. Bonie has proven herself a stalwart ally. Selben is to be left with the Anaithnid, as he would be too much a liability on such a deadly venture. Audric sends word of our acceptance to Xantharl’s Keep. The next morning arrives a small contingent of men accompanied by a withered old man, eyes white from blindness, and we assume that he is Klaighos, the priest. He is brought to Nurué’s side, Kezia seated nearby, and the man examines Nurué’s arm. 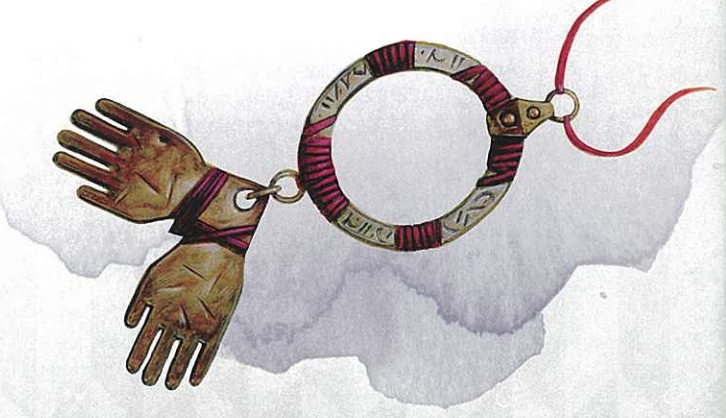 He begins chanting in preparation for a spell, utilizing a fetish, a pair of hands bound together with rope. At first it appears as if they are wooden, but upon more careful inspection, they may be actual withered hands. In either case, they are a symbol of Ilmater, the Suffering. Audric shares a blessing from Mystra as Klaighos departs, to which the priest nods in acceptance. “And that of Malar, as well,” I shout, not to be outdone. Klaighos snarls in response but makes no other gesture, instead turning his back on us as he returns to Xantharl’s Keep.